Many people talk about living in the moment. Being in the now. Or just "being". But what does that really mean? In today's society we are all going going going! We have a hundred different things to do squeezed into a finite amount of time. It is like we are all rushing to the top of the mountain to see the view, but once we get to the top we rush into the gift shop, rush to get in line for the restaurant, rush to get home to watch your favorite show, rush rush rush. Sometimes we fail to just be. We fail to take our time and to really "see the view". It was the view that created the gift shop, created the restaurant and created the drive home in the first place, but we often get so consumed with living in the past and planning out the future, that we simply forget to open our mind and our heart to this moment, right here. If you watch your mind for any length of time, it will begin to wander. It will remember something from yesterday, or will think of what you need to do later or forgot to do earlier. It will analyze this, or critique that. It will process the information around you and snap a judgement. The mind is all over the place. The period of time now occurring. 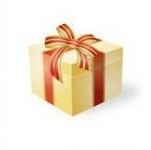 A thing given to someone as a gift: "a Christmas present"
Isn't it interesting that the present means gift? Being alive and living is really a "gift" and yet so many times we are not enjoying that simple gift. Our minds are preoccupied. Living in the present and just "being" means that we stop what we are doing and be aware of this moment. Use your senses to take in the moment. Find intrigue in what is around you. Smell the moment, hear the moment, feel the moment, and see the moment. Your mind becomes so accustomed to your surroundings that it starts to dull your surroundings to your senses. Your mind thinks it already knows the sights, smells, noises and so it goes on autopilot and forgets to take in the newness of right now. When you become aware of the moment, first, feel it with your senses. Try to take in the moment, or your surroundings as though it were the first time you experienced it. I call this "innocent perspective". Because your mind is so accustomed to your environment, it fills in the blanks of your experiences with past experiences and past information. It has already made a conclusion about how you feel about things and often it is critical, judgmental, or dissatisfied. It fills in the blanks about what you like and don't like. The mind does this automatically in order to process the world around it. There is so much information around us that it needs to make associations and keep it simple by going into auto pilot. We do this all the time. We process the world so that we know how to react to it. We are participants in this reality and must know how to act, what we are going to do, what we are not going to do, how we feel about politics, what we are going to wear today... the list goes on and on and it is this process that we sometimes get lost in. Of course we need to use our mind's faculties to process information. However, we do not need to get lost in it. We can look at the world around us as though it is the first time we have experienced it and we can watch our thoughts. We do not need to be consumed by our thoughts but we can be aware of them from a distance. We don't need to react to our thoughts or jump to the next thing, but we can keep trying to stay present and enjoy the moment. We often think that if we are not processing the "now" we will fall behind is some way. This is where the process of trust needs to be addressed. We need to trust that we are highly capable beings and that by being aware and present in the moment, all will work out just as it needs to. We need to trust that we can let go to some degree and trust that as the moment unfolds we will know what the next action is and what needs to be done. In many ways this is a miraculous process. When we are present and trust that we can simply "be" it can be amazing that we automatically know what to do, we know the next action, and we do with this an inner sense of knowing. That is a beautiful thing! When you can trust this knowing and live in the present, you will begin to notice things you never did before. You will begin to learn things about yourself and your surroundings in new ways. You will also begin to see into the beyond. By learning to "be" we can live in this moment and see the gift that it is.